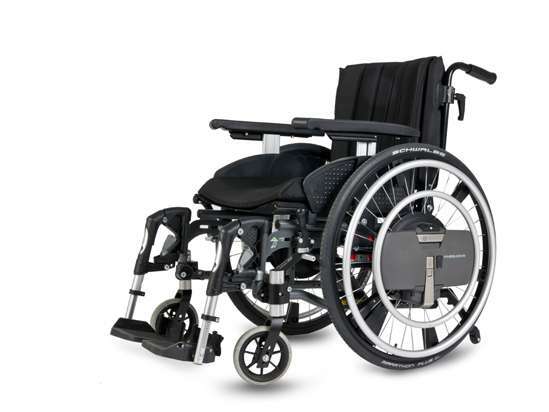 Whilst the advantages of a wheelchair with auxiliary drive are self-evident, they do not always outweigh the disadvantages. The weight of the construction can pose a physical burden on a certain group of wheelchair users, according to research from the University of Twente in The Netherlands. Mobility researcher Marieke Kloosterman investigated the effects of the WheelDrive, a wheelchair with electric-motor back up. Like an E-bike, this wheelchair should make the life of the user easier by means of an auxiliary engine. Many people in wheelchairs suffer as a result of overstraining the shoulder and other physical discomfort. Furthermore, they don't always have the strength to move their wheelchairs around by themselves. Accordingly an auxiliary drive can offer benefits. Kloosterman tested the prototype of the WheelDrive amongst both non-disabled trial users and experienced wheelchair users. Results showed that shoulder joints were less strained due to the auxiliary drive. The trial users found it less onerous to move a wheelchair with powered support than an ordinary wheelchair. However, this did not involve any significant reduction of energy consumption. In other words, in either situation – with or without an auxiliary drive – wheelchair users exerted an equal effort. Based on this result, the WheelDrive has been made more powerful. The research revealed another disadvantage of the E-wheelchair: its weight.